Camp Grant (World War I, World War II POW Camp); Opened 1917; Located - Apparently no tract of camp now exists. It was located on the current Rockford Airport. Camp Grant museum is an old camp building and the two gate posts that used to be the entrance to the camp are still there. Six Ton Tank M1917 (RARE PIECE) This is the American version of the tank, OnlyI know of 7-8 or across the United States. The M1917 Tank arrived in Miller Park on May 25th 1939 and Originated from the Rock Island Arsenal. Tank was a “gift” sponsored by the local American Legion. The American Legion gave the council their blessing to sell the tank for scrap in order to help with the World War II scrap metal drive (confirmed by Council Proceedings and article from the Panragraph). However the tank still stands today and there are no known writings of what changed from the original stance to sell the tank. Dedicated on May 30th 1913; Inscribed with the names of 6,053 local residents who fought in: American Revolution, War of 1812; Black Hawk War; Mexican War; Spanish-American War; and Civil War. Designed by Dwight E. Frink (Chief Clerk of Bloomington Election Commission). Stands 78ft tall. 35 Ft across; Woodbury Granite Co of Hardwick VT was general contractor; Bronze cast soldiers located on the statue were sculpted by Frederick C Hibbard of Chicago. 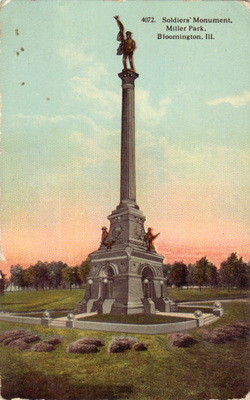 Two soldiers are located atop of the base of the structure with another located on the top pylon of the monument.